For the Windows, Xbox 360 and PlayStation 3 game, see Star Raiders (2011). 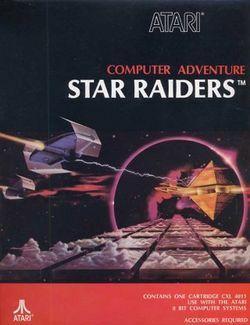 If only one game in all of video game history ever deserved the description "before its time," Star Raiders is that game. In 1979, video games were still in their infancy, and Atari had yet to clinch their dominance over the home video game market. But one programmer, Doug Neubauer (the designer of the POKEY sound chip in the 8-bit Atari line of computers), wrote a program the likes of which no one had ever seen before on a home computer, and he did it in only 8 kilobytes of memory. Star Raiders presented players with the now-familiar first-person cockpit view of space. However, in 1979, this was no small accomplishment. Star Raiders was one of the earliest games ever made to present players with a first person view of space, instead of representing the game with a 2D bird's eye view, as Space Invaders, Galaxian, or Asteroids did. Star Raiders put you inside the ship. And that's not all it did. It presented you with a galactic map that allowed you to hyperspace from one zone to another. And combat with the enemy Zylon space craft was computed in true 3D space. So while many consider the mid-90s releases Super Mario 64 and Tomb Raider to be the first true 3D games because they used a full 3D graphics engine, this game from the late 70s can rightfully claim to be the earliest three dimensional game. The effect that Star Raiders had on the fledgling video game market was tremendous, inspiring multiple copies, such as Activision's Star Master and Imagic's Star Voyager for the Atari 2600 and Namco's Star Luster for the Famicom. Its influence continued with the popular Wing Commander and Star Wars: X-Wing series. It was also a game that you could complete, which was extremely rare this early in gaming history. Upon the game's completion, the game ranked the player's performance. Welcome, cadets, to Federation Field. I'm Commander Champion, your space flight instructor. You'll be stationed here for some intensive starship flight simulation and computer training. When you've successfully completed your training mission, you'll win your Novice star and a commission in the Earth Federation's most elite fighting unit . . . the Star Raiders. We Star Raiders have a long, distinguished tradition of service to the Earth Federation and the Galaxy. Since the year 2010 we've policed the space routes, enforcing freedom of space and peaceful coexistence of the solar systems. thanks to the Star Raiders, there hasn't been a major space war since then. Space trade flourishes and the Earth Federation prospers. Now, just as we're beginning to think peace will put the Star Raiders out of business, the Zylons . . . that rabble of half-life barbarians from Alpha Solar . . . turn to space piracy and terrorism. Their object is to break up the Federations's space trade and weaken its influence in the Galaxy. Space Security has issued "cease and desist" orders to no avail. Zylon responds by hijacking our spacecraft and terrorizing starbases that harbor them. They've pushed us to the limit. Let's rid the Galaxy of this pest once and for all! Your mission is to SEEK OUT Zylon combat ships in every sector of the Galaxy and DESTROY THEM ON SIGHT. For this job we've given you the ultimate in sophisticated fighter craft. Your starship is equipped with high-power photon torpedoes, twin ion engines, and dual hyperwarp engines that transport you instantly to the furthest reaches of the Galaxy. Your computer instrumentation surpasses state-of-the-art. It includes a Galactic Chart with real-time updating, Long-Range Sector Scan for pinpoint targeting, and the most advanced Attack Computer ever devised for locking on the target and homing in for the kill. Code name for this operation is WIPEOUT. You'll be launched on your first WIPEOUT mission as soon as you win your Novice star. To complete your mission, you must destroy all Zylon targets. In a pinch, you can dock at a friendly starbase to energize and repair your starship, but be prepared for trouble. Once WIPEOUT gets underway, we expect Zylon to surround and attempt to destroy all starbases that harbor our starships. Prevent this at all costs! Remember, with every starbase destroyed, our position in the Galaxy grows weaker and the Zylon menace grows stronger. Go to it and good luck! Or as we say in the Star Raiders, "Shields up and lock on target." Start the game out by turning on your targeting computer and shields, and examine the galactic map. Choose the zone that contains enemy Zylons that are the closest threat to any starbase. Hyperspace to that zone. Arrive at the zone and clear it of all enemy Zylons. Control your speed to close the distance between you and the Zylons. Avoid getting hit by any enemy phaser bursts, and meteorites. If you are hit multiple times, you will sustain system damage. If you sustain too much damage, or are running low on fuel, you should warp to a starbase for repairs and fuel. If you allow a starbase to be surrounded by Zylon ships for too long, the starbase will be destroyed. The game ends if you destroy every Zylon, if the Zylons destroy every starbase, or if you are hit when your shields are inoperable. In addition to being released on the Atari 8-bit home computer systems, the game was also released for the Atari 5200 and Atari 2600. Advertisements for the Atari 2600 version were printed in early video game magazines. Additionally, DC Comics published a graphic novel related to the Atari Force comic book series. It chronicled the aftermath of the planet that Atari Force landed on where the fight with the Zylons was supposed to have taken place. This page was last edited on 30 May 2016, at 14:01.